Sorry for the late posting. On 3 September 2018 Otis Harris, KG6TDR became a Silent Key (SK). Otis was very instrumental in the start-up of the Glenn Amateur Radio Society. He provided guidance, direction , and principled discourse with the founding board members. Otis will, and already is, missed on the airwaves. For those that want to leave a memorial for Otis Harris, KG6TDR, please go to this link. Otis’s family has set-up this site for all to share and leave a tribute to Otis. 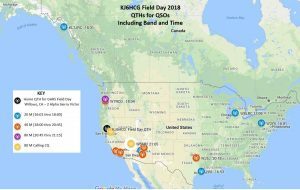 Most contacts were in response to calls, but the final two 80M contacts were responses to our having called CQ.For a larger image head to https://www.facebook.com/KJ6HCG/.